Hello feasters, foodies and folks just plain interested in what we do! 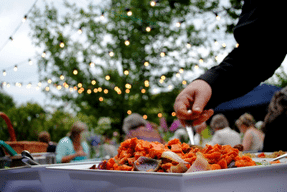 We are quite excited to launch our brand new blog and our very first Kerra’s catering blog article. In celebration of over 20 years of cooking up a hurricane of vibrant dishes for our clients using only the freshest and best local ingredients, we thought it was high time we launched a space where you could get to know us a little better, learn about our story and see what we get up to in the kitchens. Back in 1992, Kerra started working as a chef at the Ferry Boat inn, a quaint and charming pub nestled on the Helford passage. 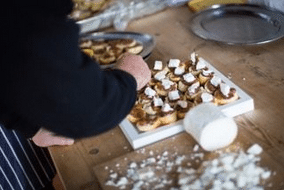 She quickly discovered a passion for creating great tasting dishes and went on a journey across the county honing her skills and learning all about the freshest & tastiest Cornish ingredients. Kerra even took a few years out of the kitchen to manage a local fishmongers where she gained valuable hands on experience with some of the best fish in the world. 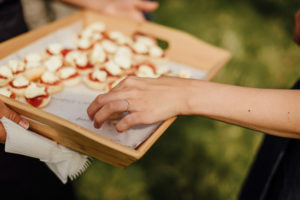 Inspired by her beautiful home county and its culture, Kerra wanted to build a brand that encompassed the values that she held dear when it came to the best dining experiences; fresh & locally sourced great tasting ingredients, creative dishes made with passion and flair delivered by a service that wowed. 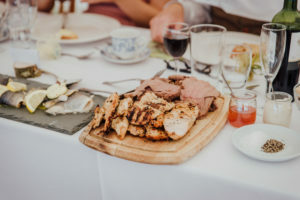 She launched Kerra’s Catering over 20 years ago, cooking up delicious meals for Cornish weddings right out of her cottage kitchen nestled in the Helford Countryside. 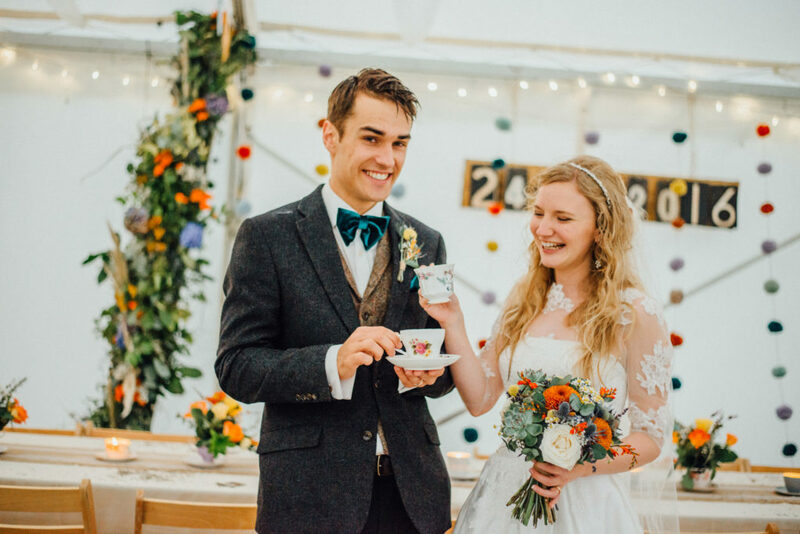 Kerra loves the romance of a good Cornish wedding and working hand in hand with her Cornish Farmer husband, Robert, nobody is more qualified than them to deliver honest, fresh & delicious Cornish Catering from a wealth of passion and experience. 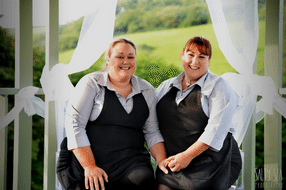 Today, Kerra’s catering has grown from its humble cottage kitchen origins and runs from its central unit in Helston covering weddings & events all over Cornwall, employing a team of dedicated, experienced friends & locals. 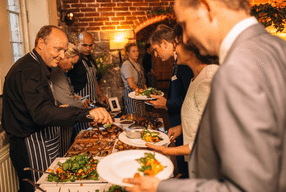 From feasts & laid back BBQ’s to boutique three course meals, our services are versatile & utterly bespoke. 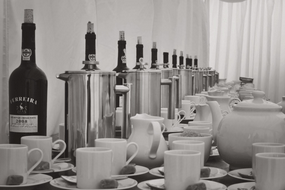 It’s not just weddings that we cover now, but private parties, corporate functions & chef hire. 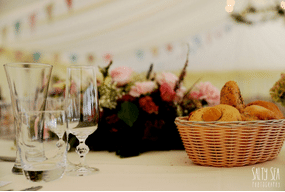 With years of experience in the industry, we can also offer event management if your looking for a team to seamlessly run your event from start to finish. So that gives you a little insight into what we’re up to right now… watch this space over the coming months to follow our exciting projects over the year, getting some back-stage access to our ventures & practice as well as foodie exploits across our breathtaking & culturally rich home county.